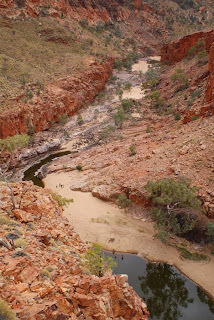 Left Glen Helen Resort and headed back through the West McDonald Ranges with our first stop Ormiston Gorge. 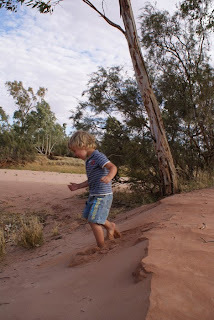 We’d seen a few waterholes yesterday and the kids were fresh and full of beans so we headed up the hill and did the Ghost Gum walk to the lookout over the gorge and waterhole instead. Really nice little climb that gave a great perspective of the range and that the kids enjoyed. 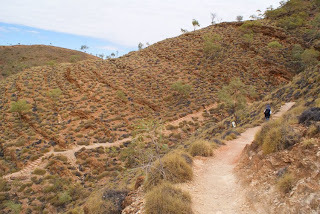 We took some snacks and sat up on the lookout for a quick morning tea before climbing back down and then heading back towards Alice. The rivers and floods are different here to up north. 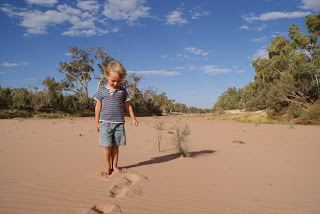 The water table here is really close to the surface and the rivers flow strongly underground. So the rivers flow after rain because the water is close to the surface more so than because the river itself fills up. 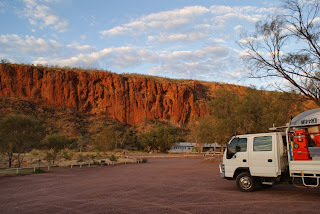 Our last stop was at the Ochre Pits . 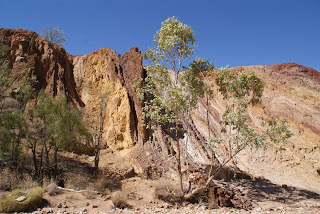 Apparently there are lots of areas throughout the ranges where ochre was traditionally gathered, and the ochre here is not considered high quality, but it was really interesting to see how it is in vertical layers all just standing up along the riverbed. And the yellows are so bright! The kids were both asleep though and so did not get to see it. I think they both would have liked rubbing their fingers in the dusty ochre. Then back to Alice for a quick lunch. Jordy had seen the playground at Macadonalds (which is how he says it) so we had to stop there so he could have a play. Which, of course, meant he was too busy to eat anything! We were the first campers there and it looked like it might be a lonely camp but then one, and another, and another campervan arrived until the area was nice and full with about eight or so of us there for the night. 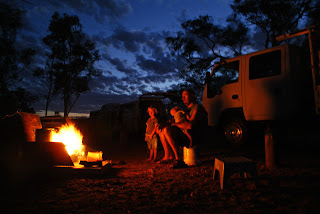 We had a great fire and chattered to a few other travellers and enjoyed the peace and quiet and an early evening.